Katana -- the traditional sword carried by the historic samurai of Japan -- is a symbol of honor, precision, and artistry in Japanese culture. Adopting the majestic sword’s name with pride, the Katana series presents guitar amplifiers with smooth, cutting tones honed by generations of dedication and expertise. 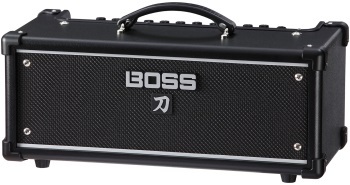 Born of the development process behind the acclaimed Waza amplifier, these innovative amps embody BOSS’s determined pursuit of the ultimate rock sound. Featuring proprietary circuit designs and meticulous tuning, the Katana series combines traditional craftsmanship and breakthrough functions to produce true next-generation rock amplifiers.